Easily grown in average, dry to medium, well-drained soils in full sun. Thrives in sandy to gravelly soils of moderate to low fertility. Tolerates some light part shade in hot summer climates, but will produce weak floppy growth when grown in too much shade or in overly rich soils. Needs good soil drainage to perform well. Drought tolerant. Propagate by divisions in spring or stem cuttings in summer. Detached leaves can be rooted in soil to form new plants. Hylotelephium spectabile, commonly known as hylotelephium, showy stonecrop, live-forever, ice plant or orpine, is a succulent herbaceous perennial which typically grows in an upright to semi-upright mound on unbranched stems typically rising to 18-24” tall. It features (a) fleshy, flat, coarsely-toothed, elliptic, opposite (sometimes in whorls of 3-4), dull green to blue-green leaves (to 3” long), (b) fleshy stems and (c) tiny, star-like, pink flowers (to 1/2” across) which bloom from late summer to frost (August-October) in dense rounded flower heads (corymbose cymes to 3-4” across). Flower color fades to burgundy brown as the flowers age. Upper leaves are sessile. This plant is native from eastern Europe to China and Japan, but has been introduced in many other parts of the world including areas of the U.S. where it has escaped gardens and naturalized in some eastern and central States including New York, Connecticut, Pennsylvania, New Jersey, North Carolina, Georgia, Wisconsin and Louisiana. 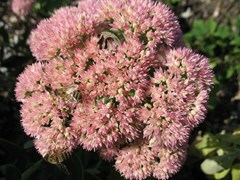 This plant was formerly known by the synonymous name of Sedum spectabile, and continues to be listed and sold in commerce by some nurseries under this name. However, at one point in the recent past, some of the taller sedums, including Sedum spectabile, were separated from the genus Sedum by some authorities and assigned to the genus Hylotelephium. Although the straight species is uncommonly sold, a large number of cultivars and hybrids are popularly sold and commonly available in commerce. Genus name probably honor Telephus, King of Mysia and son of Hercules. Specific epithet from Latin means spectacular or showy. Common name of stonecrop is in reference to the fact that many hylotelephiums and sedums are typically found in the wild growing on rocky or stony ledges. Common name of live-forever is in reference to the vigorous and persistent characteristics of this plant which is easy to grow (will regenerate from a single leaf) and whose mature foliage will remain for some time on cut stems or uprooted plants without falling off. Common name of orpine comes from the Old French word orpiment in reference to an ancient variety of Sedum. No serious insect or disease problems. Slugs, scale, mealybugs, nematodes, aphids and weevils may occasionally appear. Large rock gardens or border fronts. Specimen or groups. Ground cover. Containers.